Cheap isn’t enough, though. You need quality as well as affordability. That’s where Vonage World® comes in. Next time you’re calling the UK from the USA, we can help. 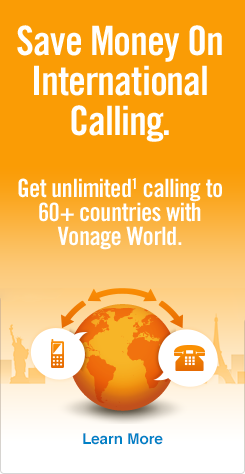 With Vonage World, you can enjoy unlimited¹ calling to Brighton landlines as well as landlines in over 60 other countries. You’ll also receive unlimited¹ calling to cell phones in more than 10 other countries. Vonage World offers the peace of mind of knowing you won’t find yourself waylaid by surprise, last-minute fees either. All you’ll have to pay is a low monthly rate. To reach Brighton mobiles there will be just a small per-minute rate extra. The choice is yours, but if you need more to go on before signing up, click the Vonage World link to see all the benefits that come with this incredible plan. If the process itself of calling Brighton from USA is giving you a headache, let us provide you with the “aspirin,” our easy-to-follow how to call Brighton guide below. Next, dial 1273 — the Brighton area code (landlines only*). Then finish by dialing the 6-digit local number. *Please note that to call cell phones in Brighton, there’s a slight difference to the dialing structure. Dial the US/Canada exit code, then the UK country code, and finally the “7” button before dialing the 9-digit mobile phone number. Cheap calls to Brighton? You bet. Now if you need one more boost to help you with reaching Brighton or anywhere else in the UK, try our how to call the UK from USA guide. What is it about Brighton, anyway? Part of the magic of Brighton comes from the fact that over the centuries, the royal family has employed this charming destination as their own personal beach resort. In fact, you can still visit the Royal Pavilion, a 19th-century palace famed for its period architecture. Or maybe you’ll head over to the Palace Pier to enjoy a meal or play arcade games. There’s plenty to do in Brighton!